Is There A Farm To Table Food Risk? This is one of three farms reporter Melinda Wenner Moyer visited last year when investigating how drug-resistant bacteria travel from the farm to your table. Farm animals are increasingly becoming sources of deadly microorganisms like Methicillin-resistant Staphylococcus aureus (MRSA) and that drug-resistant bacteria could be traveling from the farm to your table. 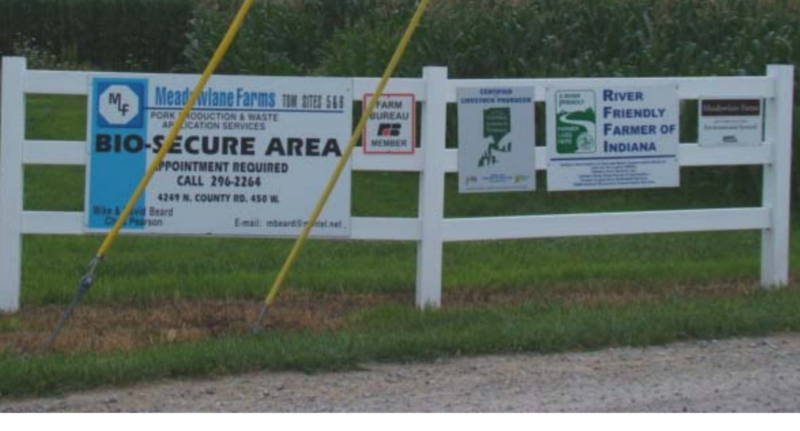 Science Journalist Melinda Wenner Moyer, in an article written for Scientific American, visited three Indiana hog farms last year and witnessed, in two of the cases, crowded barns and special feed laced with antibiotics. At the Meadowlane Farms in Frankfort, Indiana, Mike Beard is contracted by TDM Farms, a hog production company, to raise pigs from 14 days old until the age of six months. Eleven-hundred of them are crammed into a 40-by-200-foot barn. Beard is paid for the space so he told Wenner Moyer, "it's to the company's advantage to keep the buildings as full as they can." To stay healthy Beard gives the hogs feed containing antibiotics. But Wenner Moyer and others are concerned that the antibiotics are transforming innocent farm animals into "disease factories." Researchers say resistance to drugs is spreading more quickly than first thought and the abundant use of antibiotics on farms in "unraveling our ability to cure bacterial infections." The article says in 2014 drug companies sold almost 21-million pounds of antibiotics for use in food animals. That's more than three times the amount sold for human use. But there is no need to be concerned says the farm industry. Richard Carnevale, vice president of regulatory, scientific and international affairs at the Animal Health Institute, told Wenner Moyer the idea that antibiotics "in animals directly relates to a risk to human health, we believe, has been greatly exaggerated." Dutch scientists dispute Carnevale's claim, saying by 2007, one fifth of the Netherlands' human MRSA infections were identical to bacteria that had come from Dutch livestock. Proving and scientifically documenting this in the U.S. is hard. Wenner Moyer writes, "the CDC has successfully identified the source of contamination in large foodborne disease outbreaks only about half the time......it is difficult, if not impossible, to trace resistant infections back in time to their microbial ground zeros." Wenner Moyer says she is cautiously optimistic because consumers are starting to become more aware of the problem and are demanding more sustainable meat. She says the more consumers demand it, the more affordable and available it will be.